Do you remember when you first learned to ride a bike? The world changed overnight, and it raced by you as the wind blew back through your hair. Your view of the world definitely changed. That’s what nano racing offers… a new view of the world. It’s a new way to look at things – a way for the world to become an obstacle course instead of just an obstacle. We’re going to talk about a few different Nano racers today, including the X-73 from Eachine. 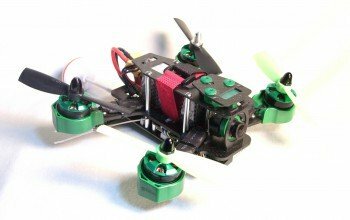 A lot of people are getting into FPV racing these days, and the cost of aircraft has really dropped. However, most racers are pretty large brushless machines costing about $200. Nano racers take advantage of modern technology to pull off the FPV racing experience at a fraction of the cost and size. The X-73 is a Nano racer designed for someone who doesn’t want to have to build anything and has money to spare. Eachine offers a number of Nano racers, including the QX80, the QX90, the QX95, and the X-73. The main difference between the X-73 and the QX series of aircraft is that the X-73 is a flying circuit board. The QX series of aircraft also all have carbon fiber frames. I’ve never been a fan of flying circuit boards, as aircraft that save weight by making the rotor arms part of the main circuit board are not very durable. A single hard crash that breaks a rotor arm means that you will have to replace the entire flight controller, and with this aircraft, it would almost be easier to buy a new aircraft. The QX series of aircraft are much more durable, as they have carbon fiber frames with a nano flight controller at the center. The X-73 also uses a smaller motor than the QX series of aircraft, but they do have plugs on them that make them easier to replace. If you want to replace a QX motor, however, you have to solder it in place. This is a lightweight 40-gram racer with a 600 tvl FPV camera. Eachine has been working hard to produce low-cost, all-in-one FPV cameras with built-in video transmitters, and I am quite impressed with the results. The frame rate, field of view, and range are all very important when racing FPV and Eachine takes that challenge seriously. The camera on the X-73 is the same as the cameras on all the QX racers, but it’s mounted sideways, it has a yellow case, and it uses a linear antenna instead of a cloverleaf antenna. I like the cloverleaf antennas much better, even though the linear antenna can be repositioned. I think the cloverleaf antennas also get better range. The QX90 is the looker of the bunch, but the X-73 doesn’t look bad either. It’s a tiny X-frame quad with a central mounted camera, and while the yellow color scheme is a little odd and the rotor protectors look a bit silly, the protectors are absolutely necessary. I would not want to crash into a wall at full speed without them; even with them I would be pretty worried. I don’t believe that it’s a good idea to make your rotor arms part of the circuit board; it’s a surefire way to total your aircraft with one bad crash. The motors and camera have plugs so they are easy to replace, but replacing the flight controller requires soldering, so it isn’t really a plug-and-play aircraft. Additionally, the flight controller is half the cost of the aircraft. The aircraft comes completely assembled and ready to fly. It comes in a tiny little box and includes a USB serial adaptor cable, but no batteries or charger. You have to provide your own batteries, charger, transmitter and FPV glasses. The X-73 only has one version, which is the FRSKY receiver version, and the only way you can fly something with an FRSKY receiver is with a $200 Taranis transmitter. You can also solder a Taranis transmitter module into the back of your transmitter. The QX80, QX90, and QX95 all offer DSM2, FLYSKY, and FRSKY receiver options, so you can use your own transmitter with any of those. If you get a kit version of the QX80 or QX90, you can build and solder everything in about 45 minutes. Binding to a transmitter and setting the arm/disarm switch takes only a few minutes and the flight controllers are pre-programmed. If you get the X-73, you can bind and fly in about 5 minutes. You can buy a pre-built QX90 and QX80, but honestly, if you’re going to get into this sport, you’re going to need to solder together something at some point. Over the past few weeks, I’ve built a few QX80s and QX90s and switched parts around on all of them. One of the nice things about the QX series is that they all use the same electronics, just on different frames. The X-73 uses a motor, frame and flight controller that aren’t compatible with the QX series. The manual is a one-page sheet of paper with binding instructions and a few technical specs. The manual isn’t going to help you solve any problems, but there is an active supportive community out there that will help. Flying a Nano racer is a whole new experience; they have the power to fight heavy winds and the precision to fly through the tiniest of obstacles. They also offer a whole new indoor flight experience. They are so small and the range is so good that you can fly them all over your house, up the stairs, around corners, under tables… it’s pretty amazing. Flying the X-73 is sort of like an out-of-body experience. The flight controllers have 2 flight modes – normal and acro – but I was never able to test any of the stock settings, since I didn’t have a compatible transmitter. Eachine eventually developed a FLYSKY Nano receiver that works with my fsi6 transmitter, so I was finally able to test the QX80 and QX90. Unfortunately I did have to build and solder the aircraft twice due to a burnt-out flight controller. It’s easy to short out these little aircraft, so be careful. The binding process is also a bit touchy; in fact, I burnt out my flight controller while filming the review for this article. I was trying to show how to bind the aircraft and my homemade bind plug slipped and touched the flight controller, burning it out in an instant. It would be nice if they included a bind button on the new fsi6 Nano receiver. I did have some trouble finding a USB cable that would work with these aircraft. I tried about 10 different cables before I found one that would connect. I found myself spending a lot of time on forums and chat groups trying to figure out solutions to problems like binding and programming. Now, don’t get me wrong… if you don’t burn out your flight controller like I did, you’ll have a pretty easy time getting in the air. In fact, everything on the flight controller is pre-programmed and ready to go. It’s when you start from scratch like I did it that things get more complicated. If you do get into this sport, you’ll find yourself changing out frames, motors, flight controllers and cameras all the time – not just because they get damaged, but because you are looking for the best flight experience. No RTF version with a transmitter is available, so you will need to buy your own transmitter. The lowest cost option is the fsi6 transmitter, of which I’m a big fan.. It has ppm support, the ability to program sub trims, endpoints and throttle curves. It has multiple model memory and a lot of other really helpful features. The cameras on these aircraft are high-quality, all-in-one cameras / video transmitters. They are extremely small, they don’t use much power, and they get great range and frame rates. They also have very nice wide-angle lenses with a great field of view. As Nano racers go, this is a nice one. It flies great, looks okay, and gets tremendous range. Unfortunately, it’s just way too fragile for a racer. If you’re going to race, you’re going to crash and rebuild this racer at some point. Personally, I’d rather have a carbon fiber frame and modular parts, like Eachine has with the QX series.